2 Micro Start XP-10 starts Diesel engines? It is a quite impressive fact that so compact multi-function device can contain so much energy. Its main sailing point is to jump start cars but definitely, this is a multi-functional device ready to solve all drained lithium-ion battery problems. 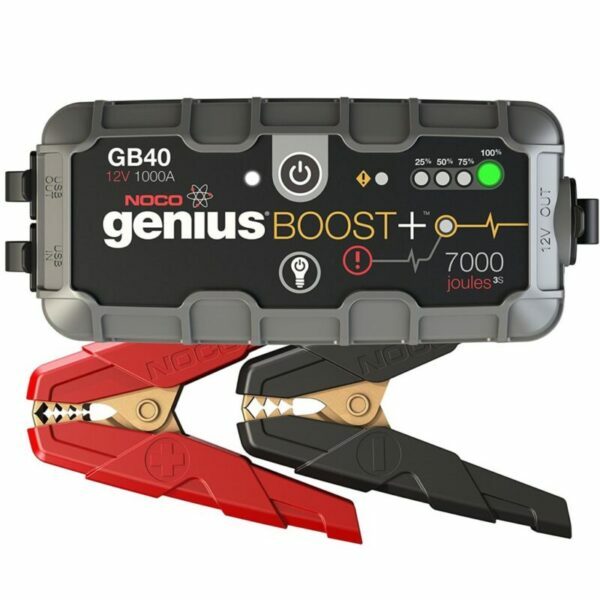 The truth is that it is a little bit longer than NOCO GB30 but again much smaller than Jump-N-Carry NC660 and weighing only 18 ounces this portable mini jump starter provides up to 600 Peak Amp jump starting ability and huge 18000 milliamps of capacity. Translated to simple language that means it can jump start heavy-duty machines even powerful Diesel engines up to 8L. With all these different connectors well organized inside of a case, almost every gadget can be recharged using Micro Start XP-10. This great power kit is offering various options for every person who needs a portable source of power. We have to say that with this dive range of equipment XP-10 definitely deserves a high place on our list of the best mini jump starters. It is lightweight and so thin jump starter you can put it in your back pocket what makes it very easy to handle and it easily fits in almost every car drawer. However, there is e.g. Micro Start XP-1 for those who want really a tiny one. But of course, it all depends on your needs. We have studied a little his appearance. Housing is made of glossy but durable plastic. On the front side of this portable power supply is a very bright LED lamp. It has a few different modes such as SOS and emergency strobe. As you keep pressing power button these modes will change until flashlight eventually shuts down. 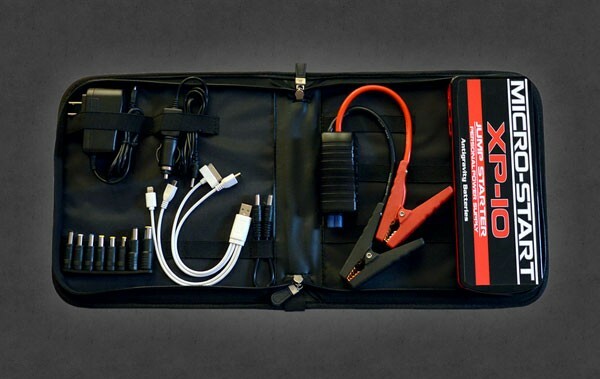 Definitely a great additional value for this multi-function mini jump starter. Besides flashlight, there are two 5V USB outputs (1A and 2A) and one output used to attach jumper clamps. Alongside with 12V and 19V output and input used to recharge this powerful portable charger, left side contains power button and five LED lamps who indicate how much energy is left inside XP-10. It is a very nice design, very thin. Altogether, it has a very nice ergonomic design. Micro Start XP-10 starts Diesel engines? When jump starting a vehicle or motorcycle you should fallow a few simple steps. First of all, make sure your problem with starting the engine is actually a drained battery problem. The second thing is to carefully read users guide related to this product. Most accidents and unsuccessful attempts happen just because some people ignore safety precaution and don’t know how to jump-start a car. If you are not sure about the whole procedure to check out our step by step guide “How to Jump Start a Car”. As manufacturer climes that Micro Start XP-10 can start Diesel engines, we did a test on a 6.0l Diesel engine. 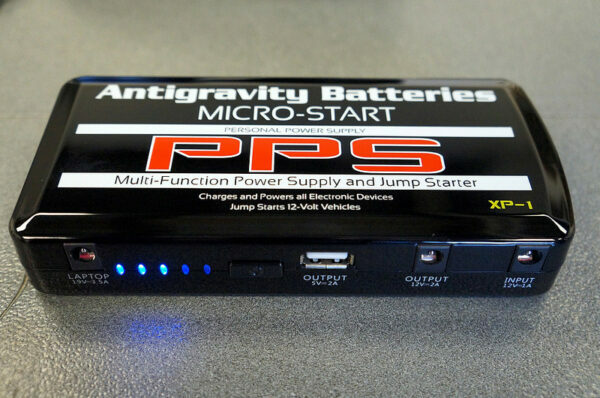 This device is the strongest one from Antigravity Batteries and it was kinda expected this powerful mini jump starter will start our drained 12V battery. The procedure is quite simple. We recharged Micro Start XP-10 in order to receive full power. It took some time but it is better to keep it fully charged always; who knows when you will need it. Also, it is quite easy to do so as you have a mobile charger so you can plug it in the cigarette lighter place in your car. Anyway, we connected detachable mini clamps and pressed “BOOST” button on clamps! So simple it is! We waited for about 20 sec. until finally turned the car key. The engine started at once! No problem at all! 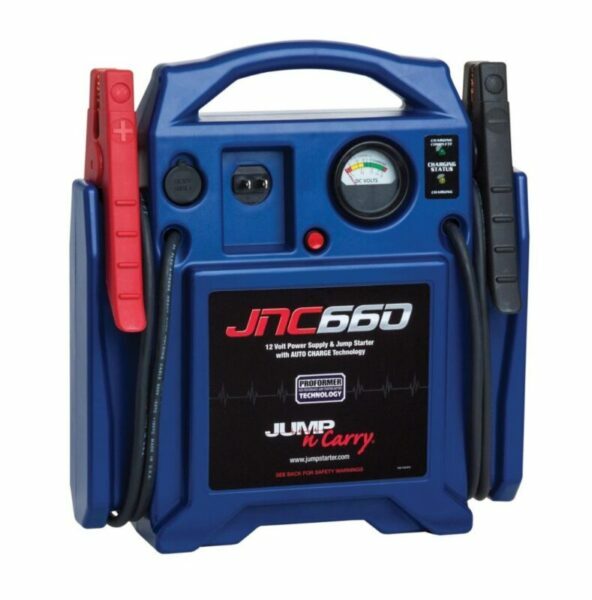 Really impressive it jump-started powerful 6.0L Diesel engine especially because we used these massive jump starters for this purpose. However, not just it jumps started our car but had enough juice to jump-start two more cars, recharged my iPad and we were not even close to draining this pocket-size powerful device. As we earlier mentioned this mini jump starter is a multi-function device. It means it can be used as a power bank to recharge most of your gadgets. 18000 milliamps of capacity make this portable power supply a must-have device when you go out for camping or any other place where you can’t recharge your electronics. Actually, it can recharge an iPhone up to seven times and also as it has 2 USB outputs it can charge 2 gadgets at the same time. If you use 2 Amp output you will be able to recharge your cell phone twice as faster than using 1 Amp output. For purposes of this review, we used it in our office and it did a great job by recharging our cell phones and Laptops. 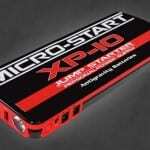 We are sharing this video below as a short presentation of Micro Start XP-10. Also, you can see how it really works as jump starter. With this Micro Start XP-10 mini jump starter, you don’t have to worry about getting burned as you accidentally touch clamps or if you connect them the wrong way. Reverse polarity technology prevents sparkling and makes this device completely safe to use even for those who are not so agile with this kind of staff. Also, a thing to notice is that you can leave this device on the charger and not worry about over-charging. So, as we tested it during this review, we can confirm that XP-10 portable power supply is perfectly safe to use and ready to meet all your expectations. 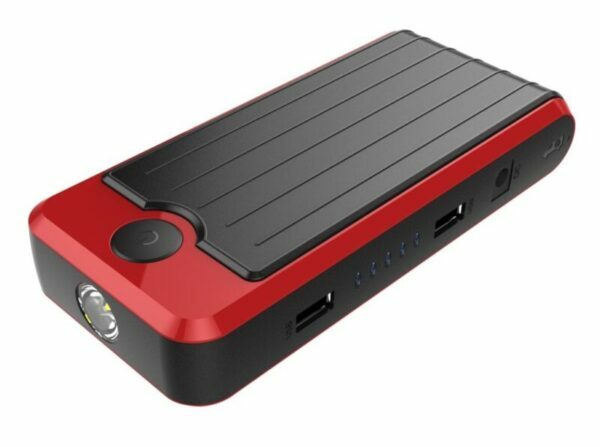 As a part of this review, we did research of the market in order to collect more useful information about this portable power supply. It is very difficult and expensive to cover every aspect of quality for this or any other product. What we did was to read other customer reviews and opinions in order to give you a clearer picture of Micro Start XP-10. Truth is that this mini jump starter has a very good reputation. We read lots of positive comments and reviews from customers who purchased and use this product either as a jump starter or a portable power bank. But there is always some information and advice worth of sharing. Some of them are related to the low quality of clamps. It is noticed that they use to overheat what causes the melting of plastic and damaging cables. To prevent this from happening we suggest you use them rationally, what basically means is not to push them hard. If your car doesn’t start from the first time don’t worry and try a few more times but be careful and check if it is overheating. If you notice it does let it cool down and try again. That appears to be the biggest problem with Micro Start XP-10 and we think it is really easy to prevent it from happening. As we already said most of the comments and reviews were positive like this one we wrote. 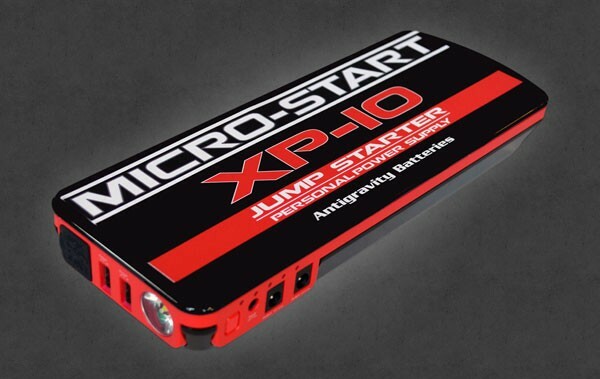 Here are some of customer opinions about this mini jump starter..
After this review and all tests we did on Micro Start XP-10 from Antigravity Batteries we can for sure say that this amazing mini jump starter is a great device every household should have. It is made in the USA and has a 3-year warranty what is another great recommendation. 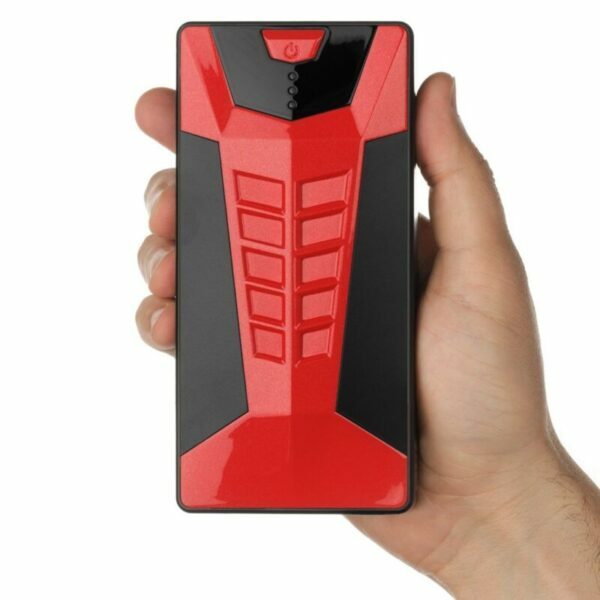 It comes in a perfectly organized case with so many different detachable tips you can use to recharge almost any electrical device. We tested it on the Diesel engine and it worked like a charm because of its great boost power of up to 600 peak amps. So if you had problems with jump-starting Diesel engine or you want to get rid of these massive, heavy jump starters you used for this purpose than we highly recommend Micro Start XP-10! However, this is also a multi-function device so use it for recharging your 5V (cell phones), 19V (different kinds of Laptops except for 16V Apple Laptops) or even those who run on 12V (we didn’t have any of these to test it, but no doubt it works). 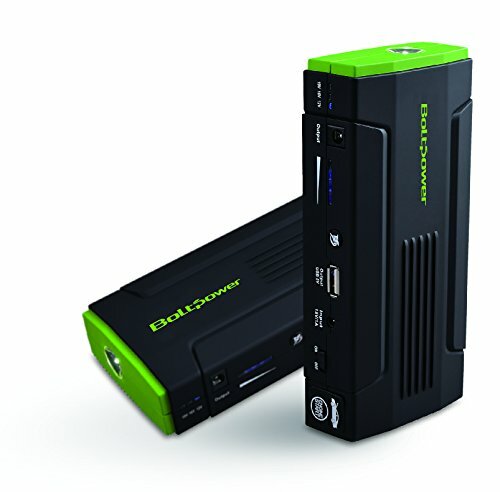 Although this overall review doesn’t cover all possible aspects and situations this mini jump starter could go trough we tried to test it in the best possible way in order to collect the most relevant information. After researching and reading what other customers say about Micro Start XP-10 we found out some interesting and useful ways to prevent a possible unpleasant situation that could happen. We suggest you use this portable power supply as it is recommended by the manufacturer and you won’t have any problems. 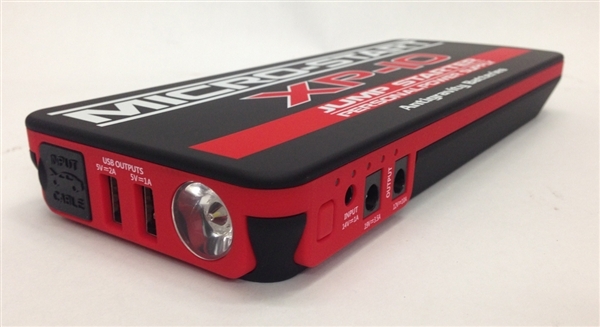 Finally, we put Micro Start XP-10 at the top of our list of the best mini jump starters in the market! This is definitely a perfect portable power supply every household should have!